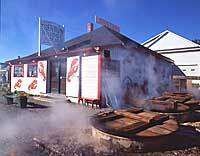 Since 1956, our family has been providing a true traditional Maine experience in eating lobster and clams. No linen table cloths or fancy glasses! Just good, old fashioned lobster fare, crackers, picks and plenty of napkins. Come as you are! Select the lobster of your choice and we’ll take care of the rest. Our lobsters and clams are prepared to perfection in seawater over wood-fired cookers! Watch your lobsters being cooked or wait with your friends and family inside or out at a table of your choice. You can buy lobster online from Trenton Bridge Lobster Pound or if you’re in the area, please feel free to stop by the building behind our restaurant to pick up some live lobster to take home with you! Copyright © 2019, Trenton Maine Chamber of Commerce. All rights reserved.